War in Yemen was planned, orchestrated, and launched by Bush/Cheney in October 2001 – weeks after 9/11 and naked aggression in Afghanistan. NATO member states, Israel, Saudi Arabia, the UAE, and other nations are US junior partners, directed by Washington, serving its interests and their own. The Saudis have been intermittently involved in Washington’s Yemen war since initiated, most heavily since March 2015. 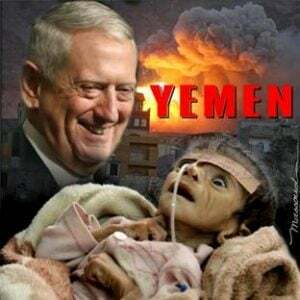 Along with US drone, other aerial, and special forces ground operations in Yemen, as well as support for jihadist foot soldiers in the country, all of the above ignored by Congress and major media, Saudi and UAE warplanes have been terror-bombing Yemeni sites. Civilians and non-military-related targets are repeatedly struck, egregious crimes of war, against humanity, and genocide ongoing – with full US support and encouragement, the way all US wars are waged, by its own rules, no others. Make no mistake. Washington provides arms, munitions, intelligence, logistics support, mid-air refueling, target selection, and overall direction for endless war in Yemen, including its genocidal blockade – naked aggression launched and continued by Republican and anti-democratic Dems for strategic US interests. A previous article explained what the war is all about – suppressed by Western media, ignored by Congress earlier and in yesterday’s Senate debate. More on its vote below. For Riyadh, war in Yemen is all about gaining full control of the Arabian peninsula, along with Yemeni oil and gas resources, modest in size but adding to kingdom wealth if seized. This endless war is all about Yemen’s strategic location. It’s near the Horn of Africa on Saudi Arabia’s southern border, the Red Sea, its Bab el-Mandeb strait (a key chokepoint separating Yemen from Eritrea through which millions barrels of oil pass daily), and the Gulf of Aden connection to the Indian Ocean. The Iranian factor is also key. Washington allied with the Saudis, Israel, and other regional partners against the Islamic Republic want the country isolated, pro-Western puppet rule replacing its sovereign independence. It’s an objective the Trump regime is hellbent to achieve, what tough illegal sanctions and orchestrated internal instability are all about – aided by falsely labeling Iran the world’s leading state sponsor of terrorism, a dubious distinction applying to the US globally, key NATO allies, and Israel regionally, along with the Saudis and UAE. The Trump regime’s call for resolving war in Yemen diplomatically belies its rage for wanting it continued endlessly. Majority bipartisan Senate members are at odds with Trump regime hardliners over Yemen. On Wednesday, a resolution to end US support for Riyadh in the conflict was advanced overwhelmingly by a 63 – 37 vote, clearing its first hurdle, approving a floor vote on SJ Resolution 54. If adopted by a veto-proof margin, the Trump regime would be congressionally ordered to end support for the so-called Saudi coalition in Yemen. Senate floor debate and voting will follow on this issue, a resolution virtually certain to pass – despite heavy Trump regime pressure against it. All of Pompeo’s above remarks are polar opposite of hard reality. In Senate testimony, he willfully committed perjury by turning truth on its head about US and Saudi involvement in Yemen. If congressional action to end US support for the Saudis and UAE in Yemen is enacted over Trump’s virtually certain veto, what’s coming remains uncertain. Will he circumvent Congress by continuing US involvement in Yemen largely or entirely unchanged? Will regime hardliners act much like how Reagan/GHW Bush counterparts ignored the 1980s Boland Amendment prohibition against supporting Contra terrorists in Nicaragua to topple the Sandinista government? Lawlessness reflects longstanding US policy. All post-9/11 Republican and undemocratic Dem wars of aggression continue endlessly. Yemen is strategically important for Washington. It’s highly unlikely that Trump regime hardliners will let Congress stand in the way of pursuing their agenda in Yemen and elsewhere. The vast majority of congressional members are on board with it all until the current debate on Yemen for political reasons because of the international furor over Jamal Khashoggi’s murder, ordered by Saudi crown prince Mohammad bin Salman. The bottom line is that both right wings of US one-party-state rule support the same imperial agenda – featuring endless wars of aggression, seeking unchallenged global dominance. Post-WW II, congressional and executive branch officials have been on the same page. Nothing congressionally or otherwise is likely to change longstanding US policy – not war in Yemen or elsewhere. Washington wants control over all nations, their resources and populations. That’s what endless wars are all about, along with serving the bottom line interests of America’s military, industrial, security, media complex.